Container ships will resume calls to Portland in January, though on an extremely limited basis. The Port of Portland said Monday that a company called Swire Shipping will begin calling at the port every 35 days. That's much less frequent than the weekly port calls Hanjin Shipping made in Portland until 2015, when it pulled out amid a labor dispute. A smaller line continued monthly calls until 2016, when it, too, dropped Portland. Hanjin left amid a dispute between the International Longshore and Warehouse Union and port operator ICTSI. Port managers had accused longshoremen of deliberately slowing down work at Terminal 6, a claim the union denied. 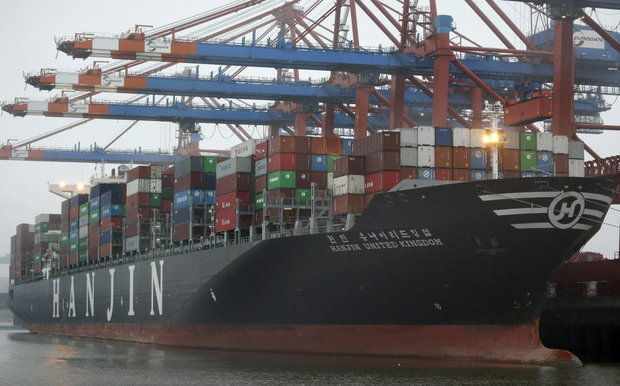 Before its departure, Hanjin shipped 1,600 containers a week, filled with agricultural exports to Asia and apparel for Nike, Columbia Sportswear and others. The Port of Portland severed its ties with ICTSI in February. Oregon provided $250,000 from the state's Strategic Reserve Fund to support the new service. The Port has been managing the terminal itself since ICTSI left. Monday's news suggests that, at least for now, the Port is resigned to continue running it rather than bringing in a new manager. That's a reversal of its recent strategy and, historically, port management has been a money-losing proposition. With Terminal 6 sitting idle, though, the Port may be more open to taking a financial hit in the interests of getting container ships back into Portland. The news doesn't necessarily mean the port has foreclosed on the idea of finding a third party to run its container terminal, said spokeswoman Melanie Mesaros. The port has hired a consultant and convened a committee to study possible business models for the terminal. That group is expected to make a recommendation to the port commission early next year. "We weren't going to not pursue opportunities while this other work was going on," Mesaros said. Meanwhile, she said labor relations have improved in the past few years. "We've been working with labor, and it would be fair to say we've got an agreement to actually work with them to bring business back to the terminal," she said. Singapore-based Swire Shipping will export Western Star trucks that Daimler makes in Portland, along with a "mix of general, non-containerized cargo and container service," according to an official announcement Monday. The news opens the door to more activity in the future, according to Mesaros. "I think there will be an opportunity to accommodate growth or more volume as the service develops," she said. Gov. Kate Brown's office said she finalized the Swire deal during a recent trade mission to Asia, and said it represents the fruits of years of effort to restore container shipping to the port. "One of the very first things the governor did when she came into office was dig into the operations around Terminal 6," said spokesman Bryan Hockaday. Daimler, which had been taking trucks to Seattle for export to Australia, welcomed the news. "The container shipping service from Terminal 6 will also allow us to better serve our customers by offering a quicker, cheaper option than transporting our trucks to another port for shipment," the company said in a written statement. The loss of container service has been a "fiasco" for Oregon agricultural exporters like Northwest Onion Co., according to Liz Wright, shipping manager for the Brooks company. "It's very difficult for us to run our containers all the way to Tacoma or Seattle. It cuts into our profit, big time," Wright said. Truckers face huge delays at the Puget Sound ports, she said, so it's hard to get onions onto ships for export around the world. Monday's news is "moderately" exciting, according to Shelly Boshart Davis, vice president of international sales and marketing at Bossco Trading, which exports straw, alfalfa and hay from Linn and Marion counties. She said Swire's infrequent port calls will give Portland the opportunity to demonstrate to other shipping lines that it's now capable of taking on more frequent service. "If we can take this small operation and get ships in and out in a timely fashion then all of the sudden they might look at us," Davis said. "It's hard to prove you're good at something until you actually prove it." Staff writer Elliot Njus contributed to this report.